The social media ecosystem is changing fast. It is becoming increasingly important for brands to create a unique presence in the online world. Brands need to catch up with the social media trends to get that desired competitive edge. This is not a cliche! It is the need of the moment. Back in 2012, getting photos on the discovery page of Instagram and have a large fan base was easy. But, now there are millions of users and often it is an uphill task to get hundreds or thousands of followers. This is not an isolated incident restricted to a particular social media network, over the years, marketers are facing the same thing on Facebook, Twitter and others. And the trends act as the savior for brands to stand out. Brands need to identify the prevailing trends and embrace those to keep pace with the social media today. Adopting the social media trends and implementing those into the existing strategy help in improving the influence and reach of the brands. Now, the question lies, why you need to stay abreast with the social media trends! A simple statistics will explain it. In early 2011 Nike had joined Instagram, now they have almost 60.4 million followers. 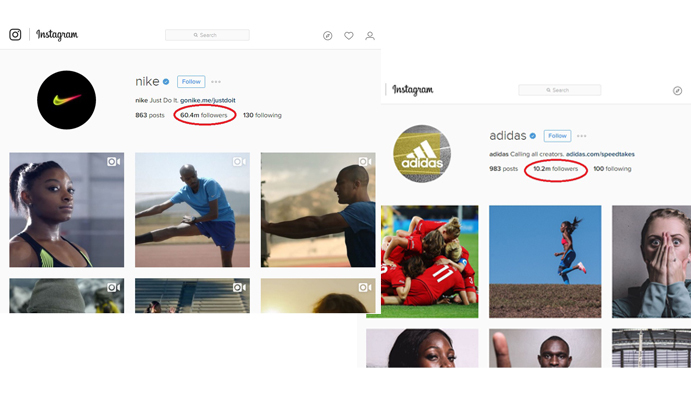 Whereas, Adidas that joined Instagram a few years later has only 10.2 million followers. So, be wise and integrate these trends than repenting later. Even big budgets will not be enough to bridge the gap between early and late trend adopters. To get a strong foothold in the competitive environment- diverse social media platforms and scattered audiences, marketers need to emphasize on the social media trends. Below mentioned are the trends that will help brands to get past the clutter and have significantly more followers, Likes, Views and Share. Significance and popularity of videos have soared high since last year. Your customers want fast access to both offline and real-time events, and Live Video Streaming is a must. Videos adds authenticity to your brand or business. YouTube was the first to start it and now all the other platforms are catching up the trend. In 2016, there has been almost 73 percent more use of videos by marketers and almost 14 percent are using live video. Facebook now emphasizes on video- introduced Facebook Live for personal and verified accounts. 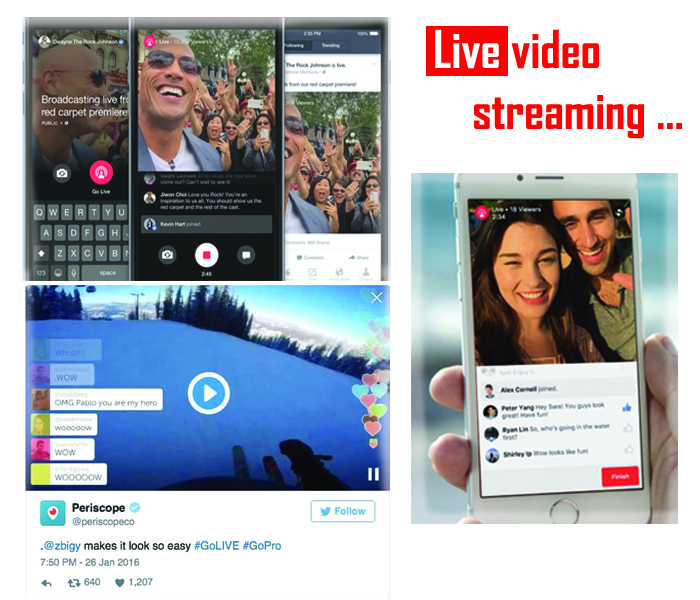 Twitter has also integrated Periscope a live streaming app into their platform, which they have acquired earlier. Another such app is Meerkat. Another latest development, is the YouTube’s plan of launching Backstage, in the later part of 2016. As per VentureBeat, it will let creators interact with the audience like never before. It is an answer of YouTube to the growing popularity of Twitter and Facebook Live. The aim of this Backstage is more activity as subscribers can reply the posts with comments and multimedia content. So if live video is yet not a part of your plan, incorporate it soon. Marketers can experiment with the various video format to know what fits the targeted audiences the best. If you do not have the in-house resources, use various tools available for the same. Social media prospers on the real-time engagement. With each passing year, the response time has reduced. Search Engine Watch, an authoritative guide to search engine marketing reveals that almost 70 percent Twitter users expect that they expect brands to respond with whom they communicate. Out of these 53 percent expect a response within one hour and if they have posted complaints then this percentage jumps up to 72 percent. A key strategy that the marketers need to adopt is a fast response time, or the competitors will take the upper hand of this situation. Owing to the advanced social listening tools, it will be easy for your competitors seize this opportunity. Your customers anticipate fast responses and you need to keep up with their expectations. Better engagement of customers means growth in sales. The social ads that you notice on various platforms are not restricted only to awareness. Pinterest was the first to introduce Buyable Pins, which was first of its kind in the arena of social commerce. In 2014, in the US, social media sale was almost $ 3.3 billion. Recent research findings also show that in comparison to the retail websites, social media has a greater influence on the buying decision. In 2015, the social media platforms had introduced features to promote social commerce. For instance, 360 Ads in Facebook aim at better experience and YouTube integrated 360 Ads for impactful visuals. It is expected that in 2016, the social media ad spending will be almost $29 billion across the globe. To flourish in social media today, marketers need to integrate similar social commerce features. On the social media today, you will find the content, both user-generated and from brands. The emphasis is on the social content. The publishers can now deliver content fast to the readers for an immersive experience. The introduction of Instant Articles by Facebook will take the development of social content to the next level. The idea of videos playing in the news feed is exciting to the Facebook readers. Now, users can read the full article without logging into another app. Thus, brands need to publish content through the social media platforms to provide an enthralling experience to the readers. Smartphone is now the primary device used by social media users. A survey in 2015 revealed that mobile traffic surpasses the desktop traffic in almost ten countries and this includes Japan and the USA. Last year also saw the emergence of other smart device like Smartwatch and Smart TV. By 2016, it is estimated that there will be almost 2 billion smartphone consumers across the globe. Another compelling stat for the perusal of marketers- 87 percent millennials confessed that they never part with their smartphone. So, marketers need to pay heed to these data and plan the social media strategies based on it. This is the last and one of the most important social media trends. For social media decision making there is no space for any form of guess work. Marketers are already familiar with image specs and character limits of different social media platforms. The next thing that you need to focus is the real-time data as it will help in developing focused social media strategy. For a long-term achievement and greater sales, analytics will play the key factor. Data generated by Social Media Analytics will help in creating a strong loyal customer base. With various Analytics and reporting tools, you can generate valuable insights that will yield platform-specific results. The information or data will help the marketers to craft a personalized and unique experience for customers. Data-driven decisions will highlight the response, engagement rates, readers’ habits rather the mere Like and Share. Early adopters will yield positive results as these six trends are here to stay. Marketers need to take leverage of these trends and get a competitive edge over others. They can reflect on the findings of the last year, follow the upcoming social media trends, to formulate strategies and implement the same to ensure success.